(Trent Nelson | The Salt Lake Tribune) Mitt Romney speaks in Orem after winning the Republican primary for U.S. Senate, Tuesday June 26, 2018. Ann Romney at right. Orem • Mitt Romney hardly broke a sweat on his way to capturing the Republican nomination in Utah’s U.S. Senate race, according to unofficial results Tuesday, earning 73 percent of the vote. Romney’s opponent, state Rep. Mike Kennedy, R-Alpine, drew only about one of four votes counted by Tuesday night. Late-arriving by-mail ballots will continue to be tallied in coming days. “Well, it looks like our team won the primary,” Romney said to a cheering crowd. The Associated Press called the election for Romney at 8:24 p.m. and Romney and his wife, Ann, delivered brief remarks at 8:40 p.m.
By 9 p.m., an hour after polls closed, the crowd was dissipating, leaving a core group of sign-waving supporters chanting “We want Mitt,” for the evening news cameras. Romney wished well to his Democratic opponent, Jenny Wilson, whom he will face in November’s general election to fill the seat of retiring Sen. Orrin Hatch. To be a great nation, Romney said, the United States must be strong. The country should live within its means as Utah does, and welcome refugees and immigrants who legally enter the country and add vitality to the nation. The former Massachusetts governor moved to Utah in 2014 after it looked like he was retired for good from political campaigning. Then his name became part of monthslong speculation about whether Hatch would seek an eighth term. Romney jumped in soon after Hatch announced he would not run for re-election. Romney finished behind Kennedy at the Utah Republican Convention in April in a 49 percent to 51 percent vote of state GOP delegates. But polling ahead of Tuesday’s primary showed the former Massachusetts governor and presidential candidate with a commanding, if not insurmountable, lead. The two candidates held a single debate, in May, at Brigham Young University’s KBYU studio. Their positions were aligned on most issues, but the men sparred over Romney’s criticism of Robert Jeffress for the pastor’s past denunciations of The Church of Jesus Christ of Latter-day Saints, of which both Romney and Kennedy are members. Looming over the election is the question of what role Romney might play in regards to Trump — counterpoint or cheerleader. Trump’s fiercest GOP critic in the 2016 campaign — labeling him a “fraud” and a “con,” Romney later made amends as he was considered for secretary of state in the new administration. 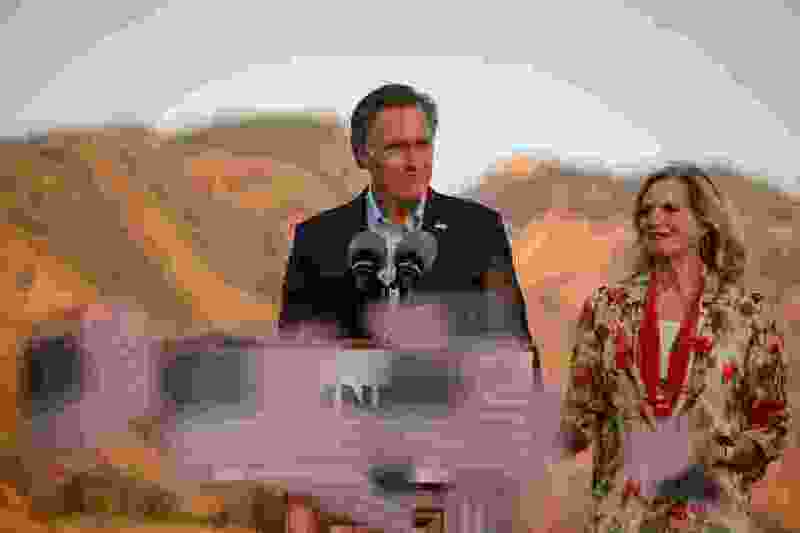 In an opinion piece published Sunday in The Salt Lake Tribune, Romney said he would be neither toady nor thorn to the president. In a statement, Wilson congratulated Romney on his win and said she looks forward to an issue-based debate. Utah Lt. Gov. Spencer Cox, whose office oversees state elections, joined Romney’s election-night party Tuesday. Speaking before polls closed, Cox said he was honored to be with Team Mitt on election night, and praised Romney as uniquely qualified to succeed Hatch. Rep. John Curtis also showed up to support Romney minutes after securing his own victory in the 3rd Congressional District GOP primary. State Sen. Curt Bramble, R-Provo, and state Reps. Lowry Snow, R-St. George, and Norm Thurston, R-Provo, and Mike McKell, R-Spanish Fork, were also present at the Romney event.